Preheat oven and prepare brownie batter according to package directions. Mix 1/2 cup pecans and 1 cup Rolo pieces into brownie batter. Pour batter into a greased 9×13 pan. Bake brownies for 28-31 minutes, until a toothpick inserted comes out mostly clean. 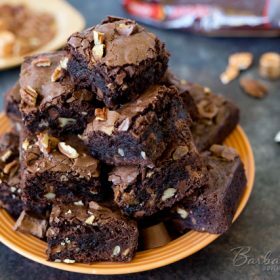 Remove brownies from oven and sprinkle 1/4 cup chopped pecans and 1/4 cup chopped Rolos over brownie top. *I used two bags of Ghirardelli Triple Chocolate Brownie Mix from 120 ounce box at Costco and cooked the brownies for 50 minutes. I did not double the Rolos and pecans.